Today is Cream Cheese Brownie Day! 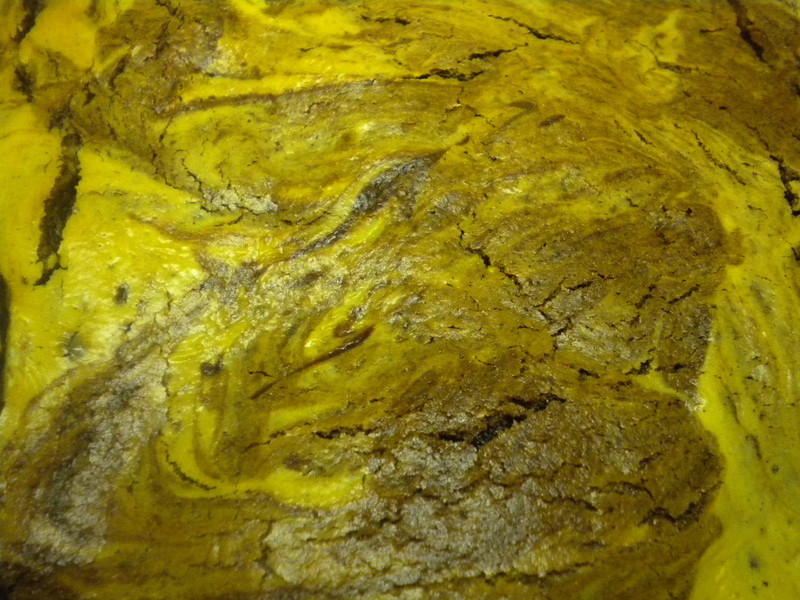 You can try my easy recipe at /brownies/cream-cheese-brownies/ and use the photos below as a guide. First of all assemble all your ingredients and equipment. Preheat the oven to 350 degrees and set the rack at the middle position. To mix the Batters, you can use an ordinary mixing bowl and wooden spoon or you can do what I did and use your Food Processor. 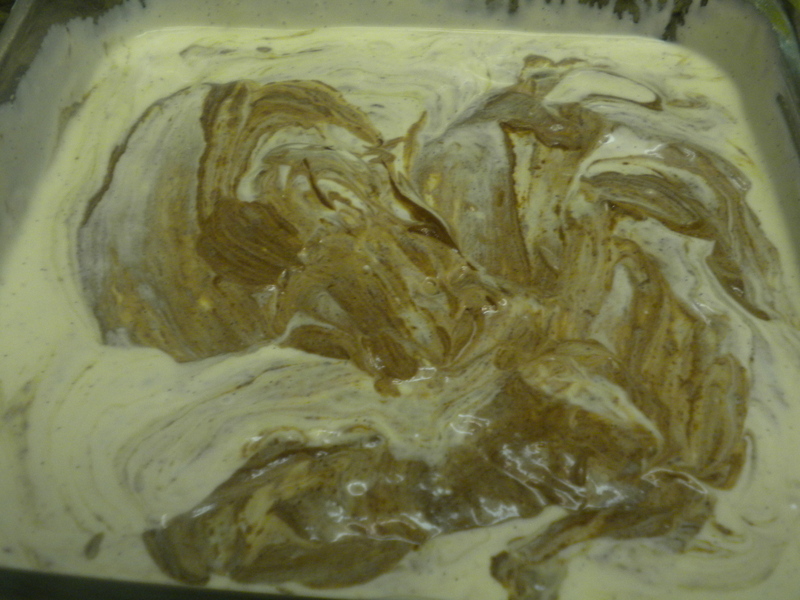 The nice thing about using the Food Processor is that you make the Cream Cheese Batter first and the Chocolate Batter second so that you do not have to wash out the bowl between the Cream Cheese and Chocolater Batters. Spray your baking pan with a Vegetable Spray or lightly coat with butter or shortening. Make your Cream Cheese Batter by combining the softened Cream Cheese with the Sugar, Eggs, Flour and Vanilla. Beat very well until all the Cream Cheese has been combined with the other ingredients. 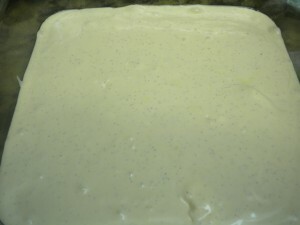 Pour the Cream Cheese Batter into the prepared pan. 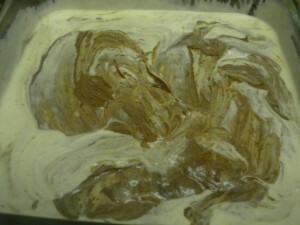 Next make the Chocolate Batter. 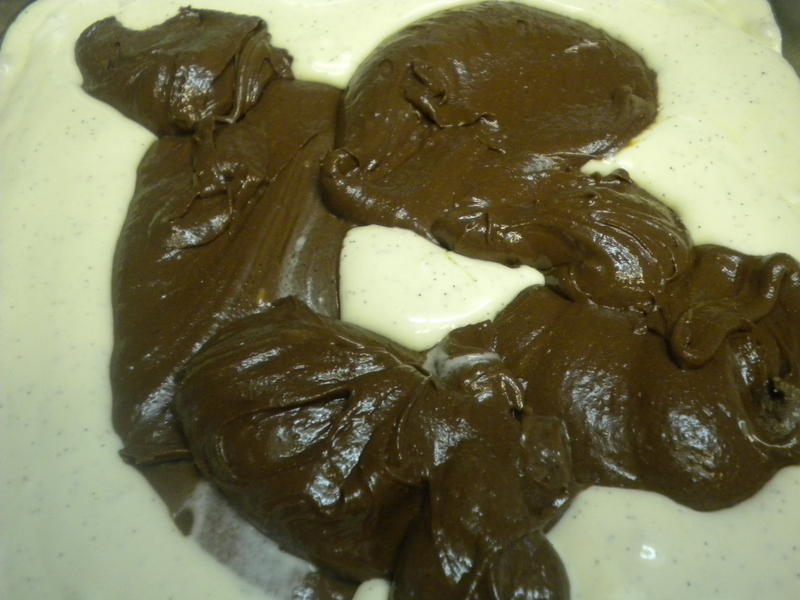 Transfer the Chocolate Batter to the top of the Cream Cheese Batter and then Swirl the Chocolate Batter into the Cream Cheese Batter. A pair of Chopsticks is a good tool for this or use a narrow bladed spatula. Next place in the oven and make for 35-45 minutes – depending on your oven and the material you pan is made of. Normally if baking in a class dish, the oven temperature should be lowered 25 degrees, but I usually don’t do that. 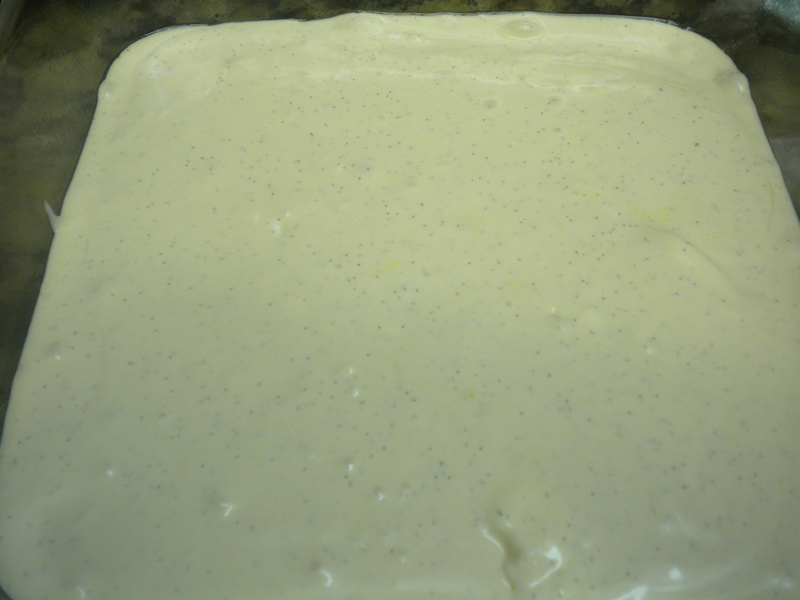 A toothpick inserted in the middle should come out clean when the Brownies are done. The recipe make a lot of Brownies so if you don’t have a large family or are not having a party and don’t want to freeze the extra, just divide the recipe in half. To divide the 5 eggs called for in the Cream Cheese Batter, use 2 Jumbo Eggs instead of large eggs. July 14th is Bastille Day in France but in the United States it is Macaroni Day. What better way to consume your macaroni than in the All American Favorite – Macaroni and Cheese. 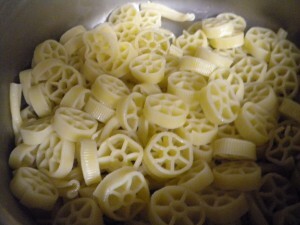 There are many ways in which you can make this yummy dish and there is a whole range of pasta shapes that one can use. One of the favorites of my family is Wagon Wheels, the shape that is reminiscent of the American Pioneer’s trek westward. Bring at least 4 quarts of salted water to a rapid boil. The salt adds flavor to the pasta and also increases the temperature point of the water, thus making the pasta cook faster. Once the water comes to a rolling boil, add the Pasta, stir and continue boiling (uncovered) for anywhere from 8 – 12 minutes. (This will depend on the pasta used) It can be just a tad undercooked if the Mac & Cheese is to go into the oven. All pasta should be cooked to ‘al dente’ which gives it just a little bite. While the Pasta is cooking, begin making your Cheese Sauce. Shred your Cheese if you purchased block cheese and set it aside. 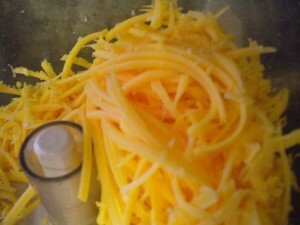 In the photo above, the Cheese is sitll in the Food Processor but with the blade removed. Dice your Onion (about ¼ cup will do); using the Onion is optional but it does give nice flavor to the cheese. Use a large Saucepan and melt the Butter over low heat; add the Onion and cook until soft. Next stir in the Flour and continue stirring until a paste is formed. Slowly add the Milk, stirring continuously. 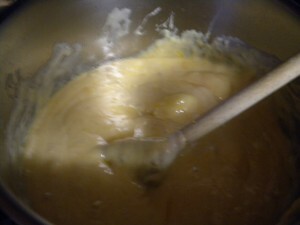 If the mixture seems to be a little lumpy, use your whisk to smooth it out. Cook and stir until the mixture thickens (it should be able to coat the back of a metal spoon). 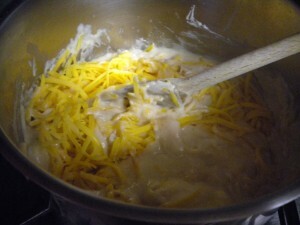 Once the White Sauce is of the desired consistency, add the Shredded Cheese and the Cream Cheese. 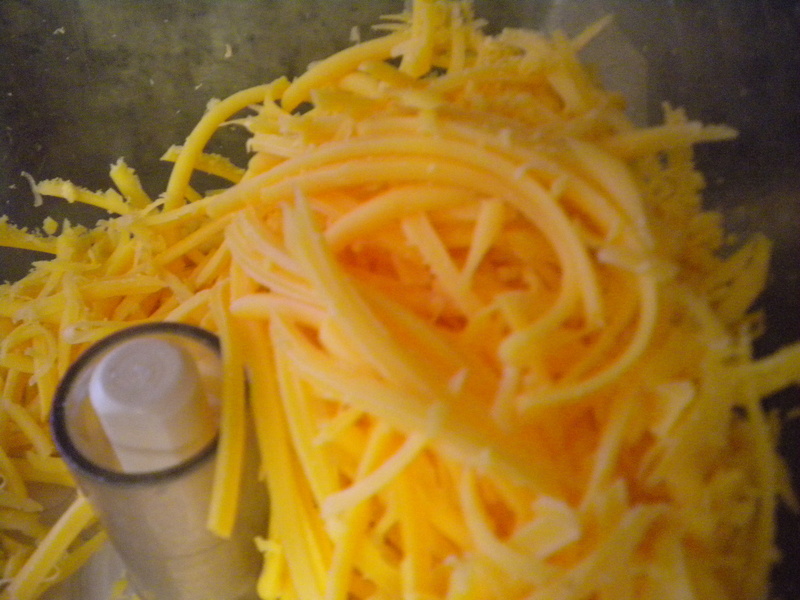 If Gouda is used instead of Cream Cheese, this should be shredded along with the Cheddar Cheese. Pour the cooked Pasta into a colander and shake out all the water. If you don’t add the Cheese Sauce immediately, rinse the Pasta with warm water to keep it from sticking together. 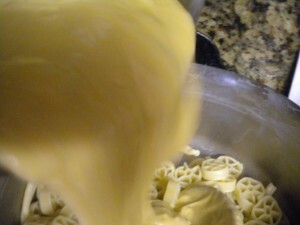 Return the Pasta to its cooking pot and slowly add the Cheese Sauce. Gently mix, over and under, to coat all the macaroni. 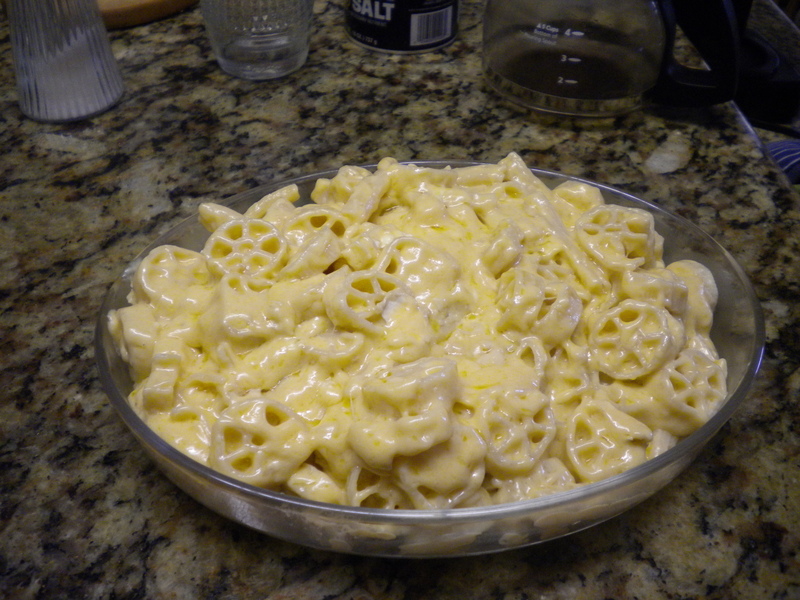 Transfer the Cheese coated Pasta to a baking dish. About ½ hour before serving time, place the dish in the oven and heat until the Mac & Cheese is thoroughly heated through. (This will take about 20 minutes) Mac & Cheese can be made early in the day or the night before, but be sure to refrigerate it until ready to use. If you do refrigerate it, allow the dish to warm up before baking or place it uncovered, in a cold oven and then turn the oven on. This will allow the dish to warm up slowly without being stressed to the point of breaking. This is just one way to enjoy Macaroni. You can use any shape pasta you desired and any combination of cheeses. So enjoy Macaroni Day with your own creation of Mac & Cheese or a Macaroni Salad. 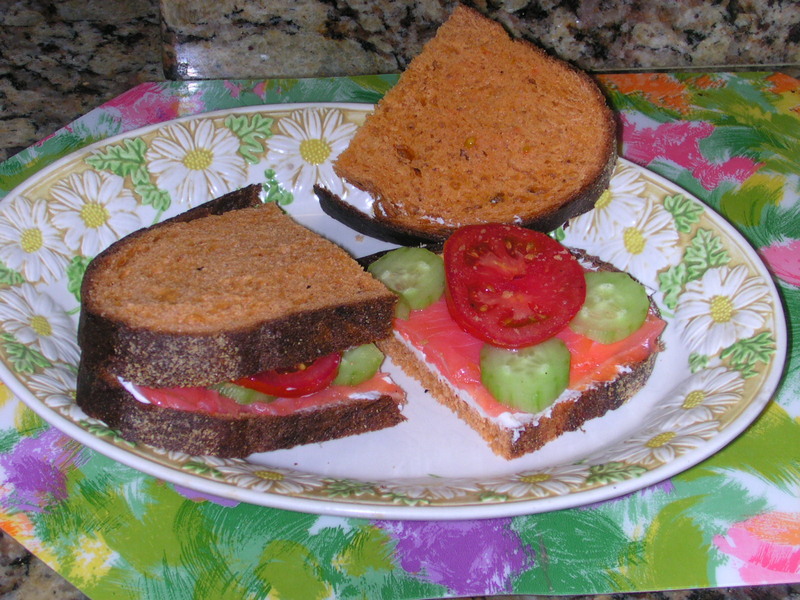 Now that you have baked your tomato bread, what to do with it other than butter it and eat it? 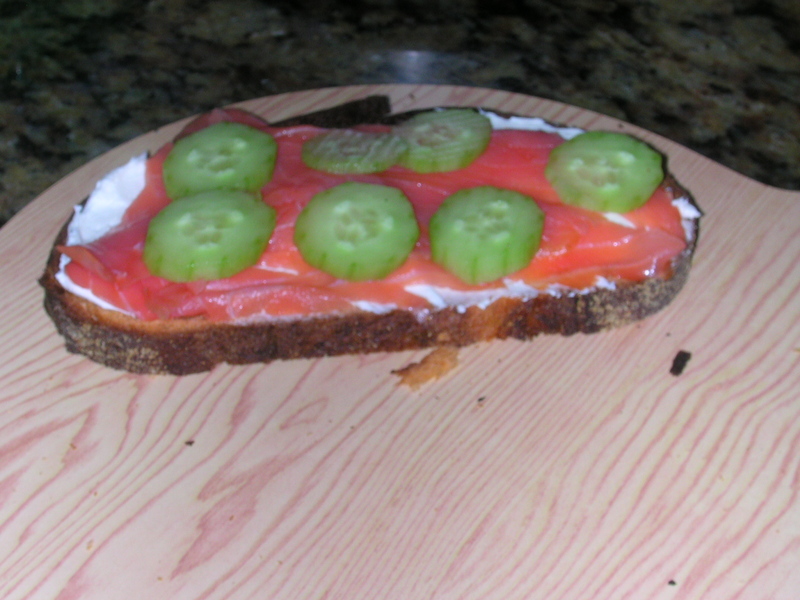 Since the recipe makes such a large loaf there are numerous things that you can do with it. 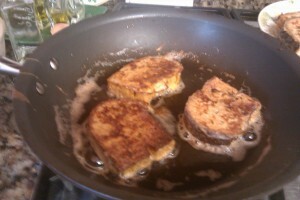 So far, we have made Grilled Cheese Sandwiches, Smoked Salmon and Cream Cheese Sandwiches and best of all, French Toast! French Toast with Tomato Bread? Yes indeed! It is tasty and the color of the bread acts as a nice browning agent giving your French Toast immediate eye appeal.